In my previous post I mentioned that I had taught a class aimed at helping the holiday host prepare a bountiful table for overnight/out-of-town guests. The idea for this class came to mind when I was thinking about one of my own favorite holiday memories. For the first decade of my life I lived in the same city as both of my sets of grandparents. This made seeing everyone for the holidays easy. I have wonderful memories of that time. The holidays basically meant getting to spend time with my grandparents…but still being able to sleep in my own bed (an ideal situation for a kid as far as I’m concerned). Around the time I turned ten my dad was transferred to Minneapolis—which was about 8 hours (by car) away from all of my grandparents. I don’t think we even considered not making the trip back that first Thanksgiving. On the Wednesday before Thanksgiving we got in the car sometime in the early afternoon and headed “home.” About the time we crossed the Minnesota-Iowa border, we ran into some bad weather. A rain-snow mix that hit at just the right temperature turned the interstate into a sheet of ice. The roads were of course filled with holiday travelers, and traffic from the border to Des Moines began to move at a crawl…sometimes stopping altogether. This was in the days before cell phones. It was a tense situation. I don’t know if my parents toyed with the idea of spending the night in Des Moines or not, but after calling my Grandmother when we finally made it to Des Moines we decided to press on. We were assured the storm was mostly north of I-80…and I believe the rest of the drive was uneventful. When we finally arrived at my Grandmother’s house it was probably past midnight. As we walked in the door she was just pulling a jam and cheese filled pastry out of the oven. Looking back I suspect it wasn’t part of her original plan (originally, we would have arrived in time for a late dinner). But since she would have had another four hours (at least) to wait after we left Des Moines, I’m guessing she decided to bake. Doing so would provide an activity for her while she waited…and would provide exhausted travelers with a very special treat. And I will never forget it. Going from being tired, stiff and a bit chilled to sitting in her warm kitchen, around her table at an hour when I was normally not allowed to be out of bed, eating a sweet pastry with all of the adults (who were so relieved that everyone was safe), was a treat indeed. I have no idea if she ever made that pastry again. I don’t think I have ever come across the recipe in her files. But when it came to mind recently I remember thinking about what a wonderful hostess—and cook—my grandmother was. And how good food is one of the best things you can provide for your guests. The trick of course is to figure out how to provide this without wearing yourself out. And this is where my class comes in. 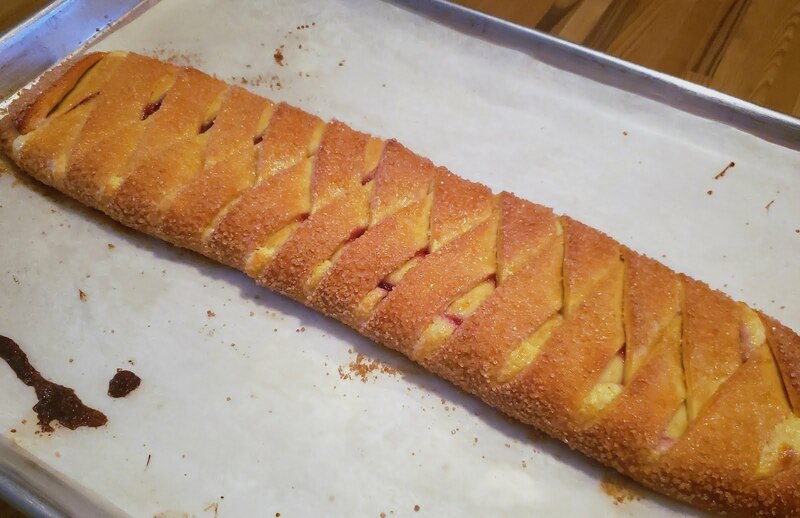 I had to include a jam and yeast filled coffee braid in this class. In looking around for a recipe I found that the most likely candidate was one at King Arthur. I have adapted it quite a bit to suit my preferences…and also to make it so that a preparations schedule will slide easily into a busy host’s schedule. 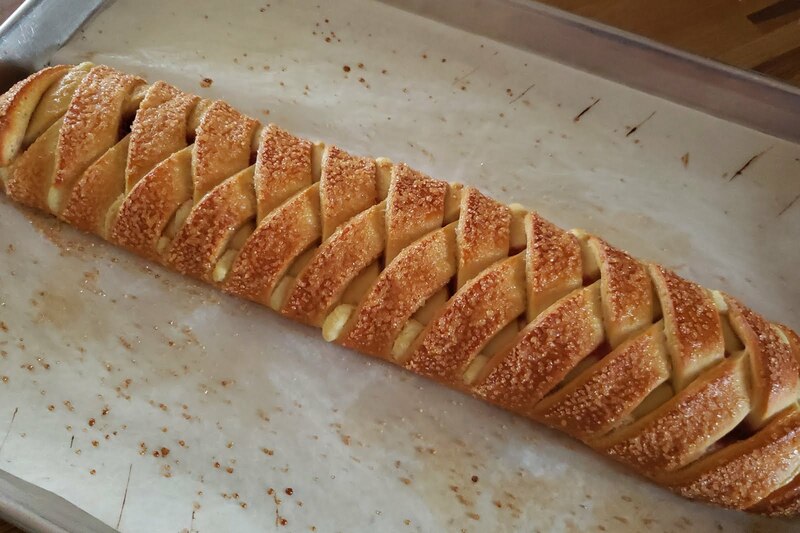 The original recipe is made with a very traditional schedule: make the dough, let it rise, form the braid, let it rise, then bake. The rich dough takes a long time to rise and the process from start to finish takes about four hours (not including baking). 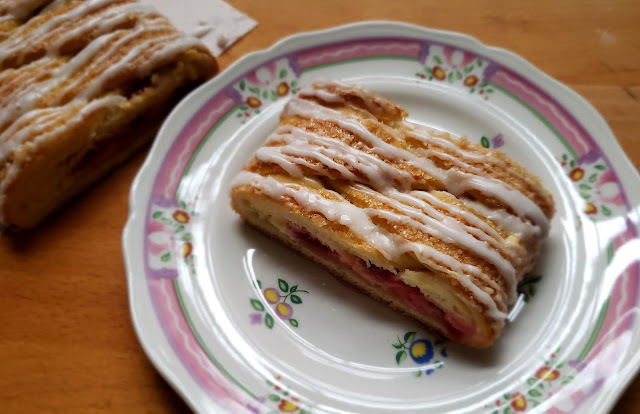 This makes it so you either have to make it the day before and serve a day-old breakfast pastry to your guests (not the end of the world…but why not have freshly baked if you can? 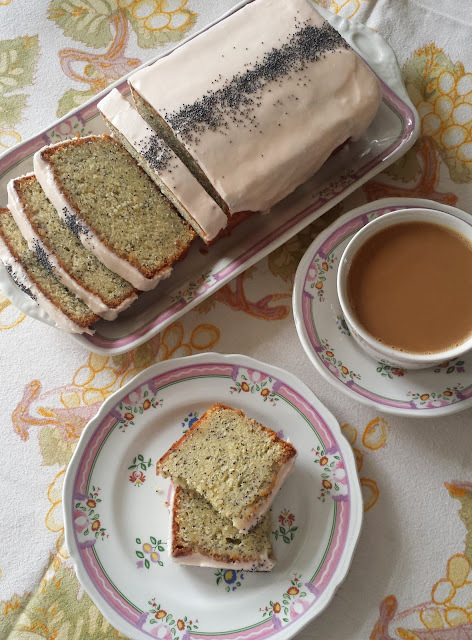 )…or make it for an afternoon, evening or late night treat (which would have been what my grandmother did). 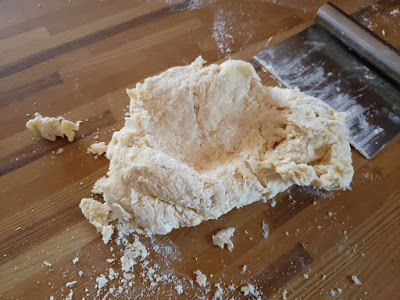 But beyond these logistical and timing difficulties, I have to admit that I never make a butter and egg rich dough that has to be rolled out thinly, filled and manipulated with cuts and twists, without giving it a long cold rise in the refrigerator first. Doing this firms up the butter and makes it so the dough is extremely easy to work with. I learned this the hard way the first time I ever made a Babka. I couldn’t believe the difference chilling the dough made. 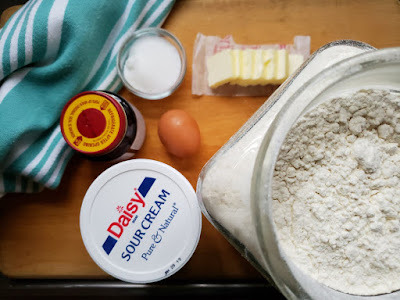 So when I make this dough, I make it at least 8 hours before I want to use it and let it rise very slowly in the refrigerator. You could even make it two or three days ahead and it would still work just fine. 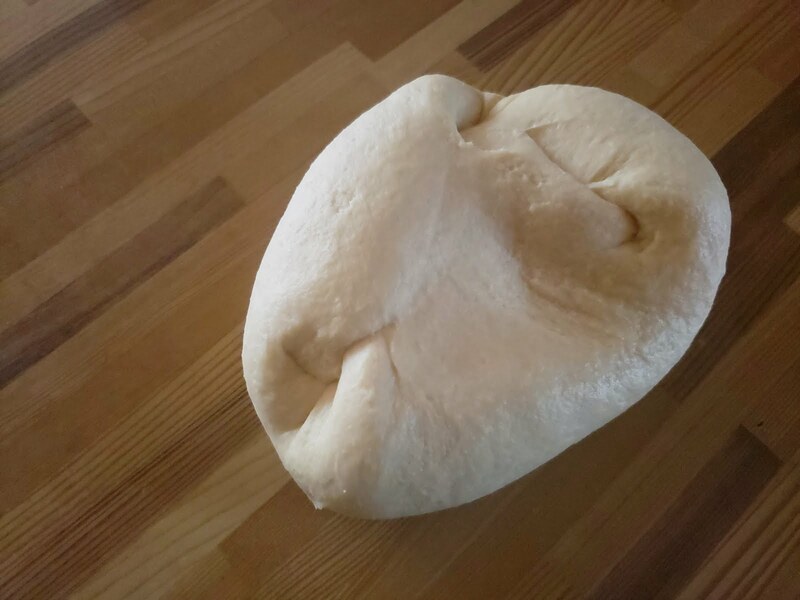 The second rise, after the dough has been formed, takes an hour. This too is a bit off-putting for the host. 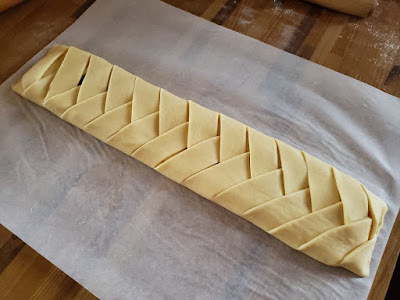 Personally, I am in the habit of rising early, before the rest of the house, so it would not be a problem for me to get up, pull out the chilled dough, roll the dough and form the braid and then do other things while everyone else is still asleep and I wait for the braid to rise. 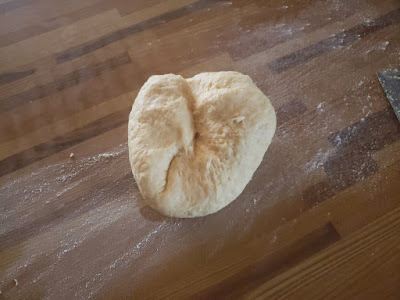 But for this dough, I found that I like the result even better if I roll and form the braid and let it rise over night in the fridge. 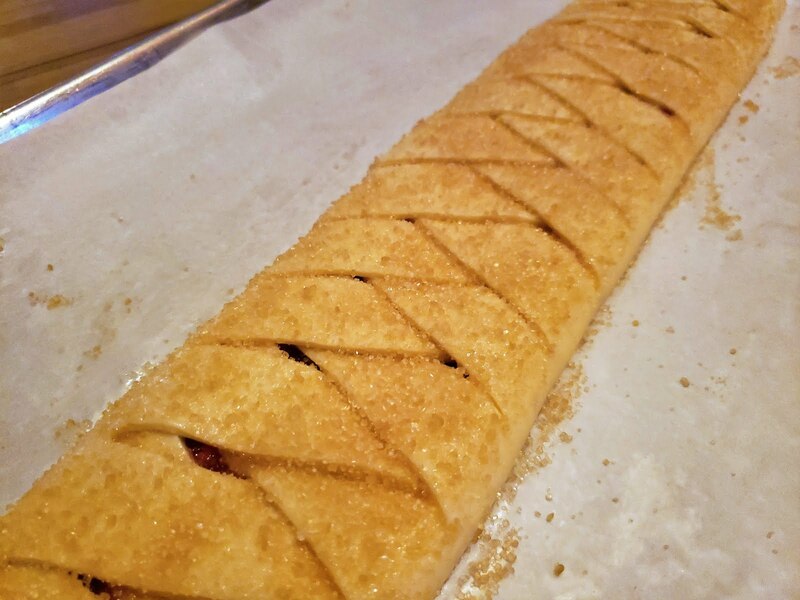 In the morning, I just pull it out of the refrigerator and set it in a warm place (mostly to take the chill off of the sheet pan) while the oven preheats and then bake. You don’t have to get up early at all. The braid will bake in the time it takes to make coffee and tea, set the table…and pull out everything else that you want to serve. For the non-early riser, this is clearly the best way to go. As it turns out, the texture of the loaf that rises for an hour or so at room temperature and the one that rises overnight in the fridge are a bit different. Both are delicious. 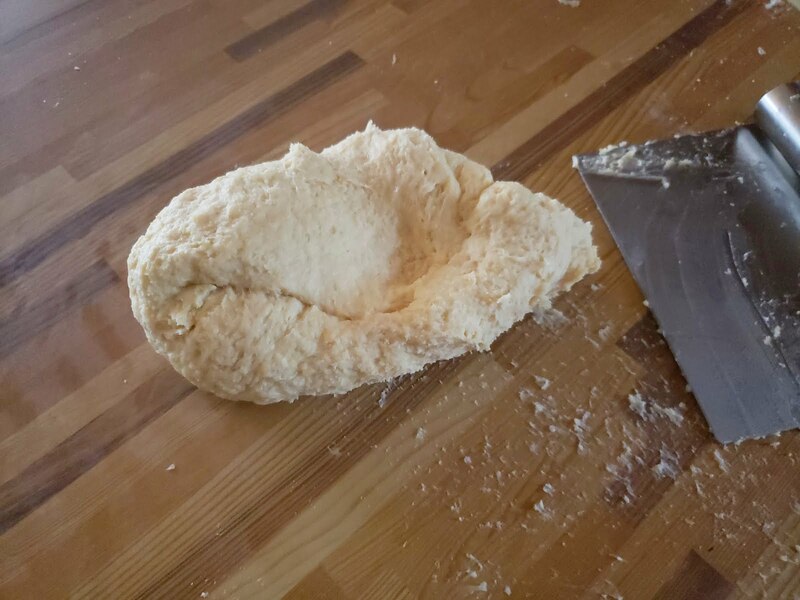 Neither loaf will look like it has done anything like rising—let alone “doubling in size”—when it is ready for the oven. The one that proofs at room temperature might have a slightly puffed look…but you have to look closely to see it. 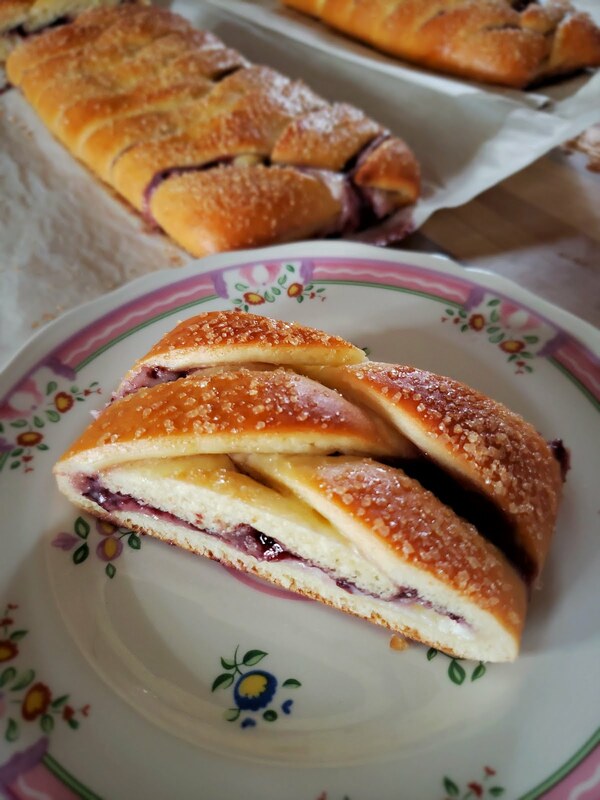 And this one—the one that is allowed to proof at room temperature—will have more the character of a filled loaf of bread….basically slightly sweet, soft bread with a bit of jam and cheese (pretty tasty). 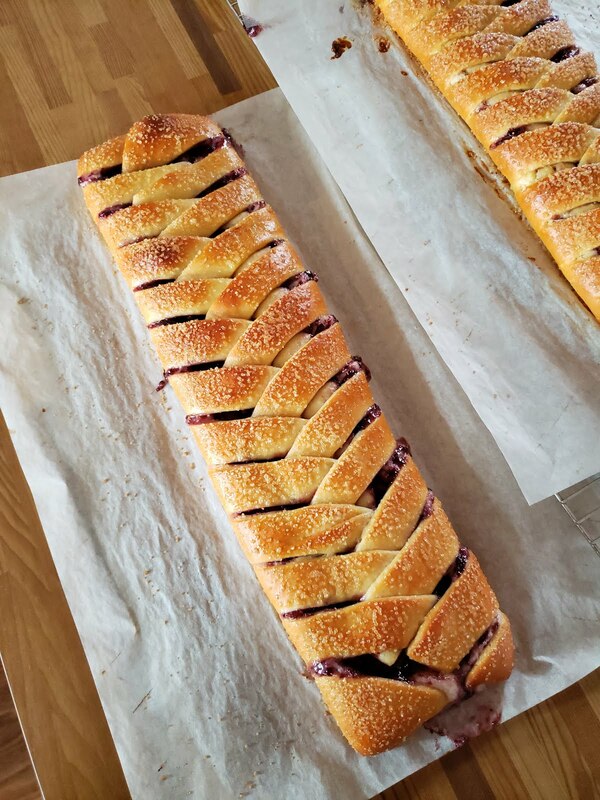 The one that spends the night in the fridge will have the flatter aspect of a traditional Danish braid and the bread portion will be less prominent…basically more like a jam and cheese pastry. As I mentioned above, this latter version is actually the one I prefer. Since the recipe makes two braids…and once you have made the dough you can make the braids any time you like…you should try both methods and see which one you prefer. When I made this recipe for my class I filled the braid with a cornstarch thickened commercial jam (like my Grandmother’s). 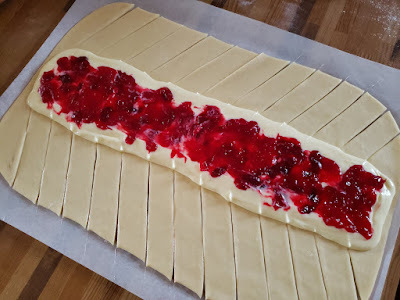 But when in the week following the class I decided I wanted to have the braid for Sunday breakfast, I made a thick cranberry compote to use instead. If you have a few minutes to make it, I have to say that this is the way to go. 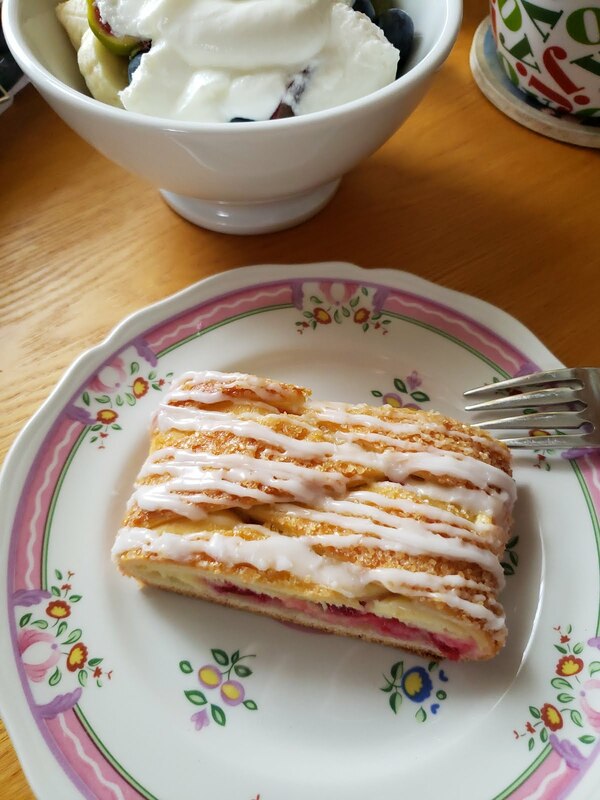 The bright, tangy cranberry flavor is set off very well by the sweet cream cheese. It is of course seasonal and festive too. I am including instructions for both, as well as recipes for a couple of other fillings from Beatrice Ojakangas’s Danish recipe in the book Baking with Julia (a quick berry jam and a compote of dried apricots...both are delicious). 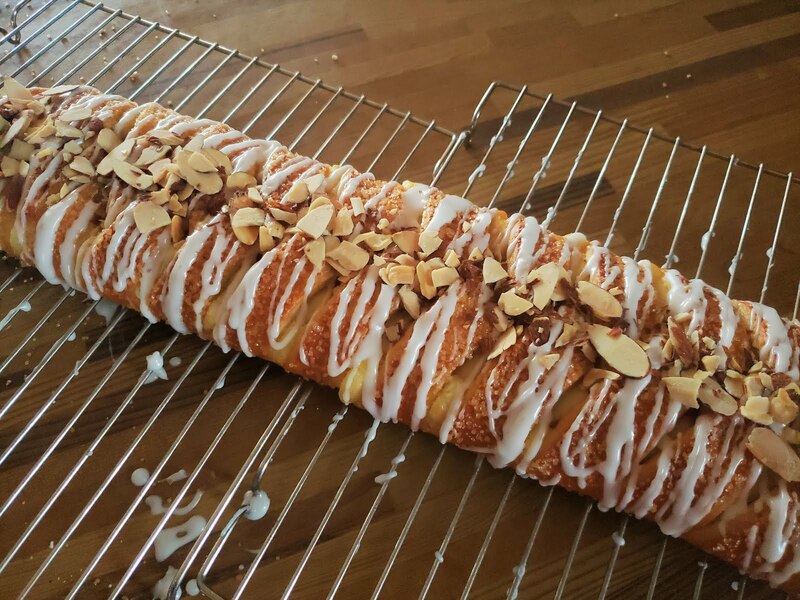 Finally, I have added a drizzle of a simple powdered sugar glaze to the finished and cooled braid. You can make and serve the braids without adding this, but I think it adds a beautiful finished, appetizing look. 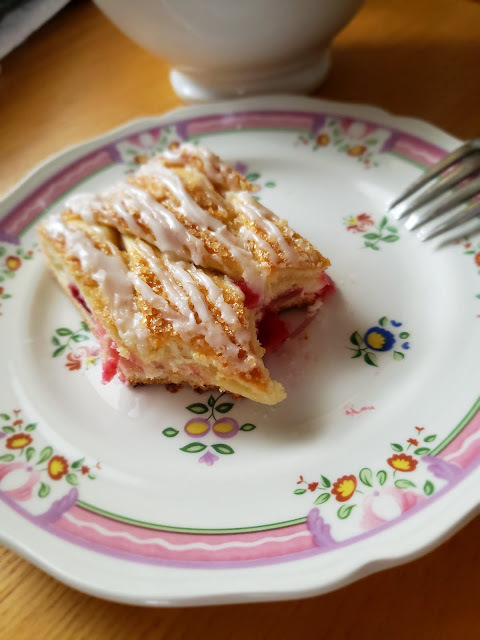 Just the thing to greet your hungry travelers—whether they are coming in the front door after a long day on the road…or crawling out of bed and looking for something to get their day off to a sweet start. 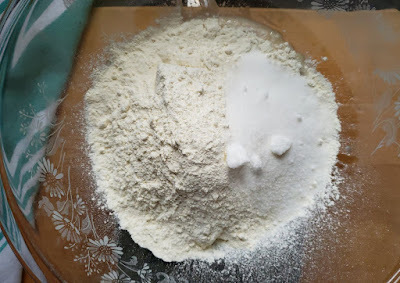 adding only 340 grams of the flour and making sure the salt doesn’t touch the yeast-water mixture directly. 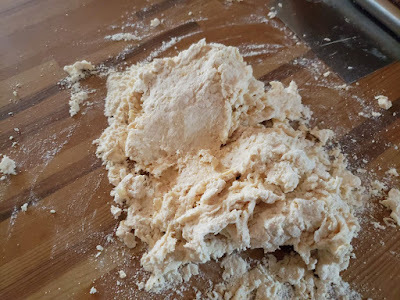 Mix and knead (by hand or mixer fitted with a dough hook) until you have a smooth, velvety dough. 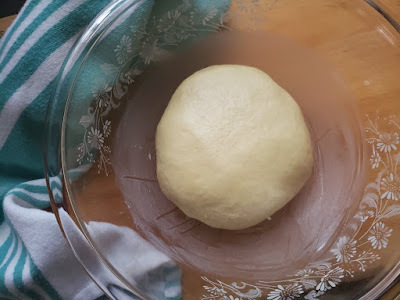 The dough will be very dry at first; resist the urge to add more liquid. It'll come together and smooth out as you knead. Once the dry ingredients are absorbed (and this only takes a minute or two) the dough may begin to stick. 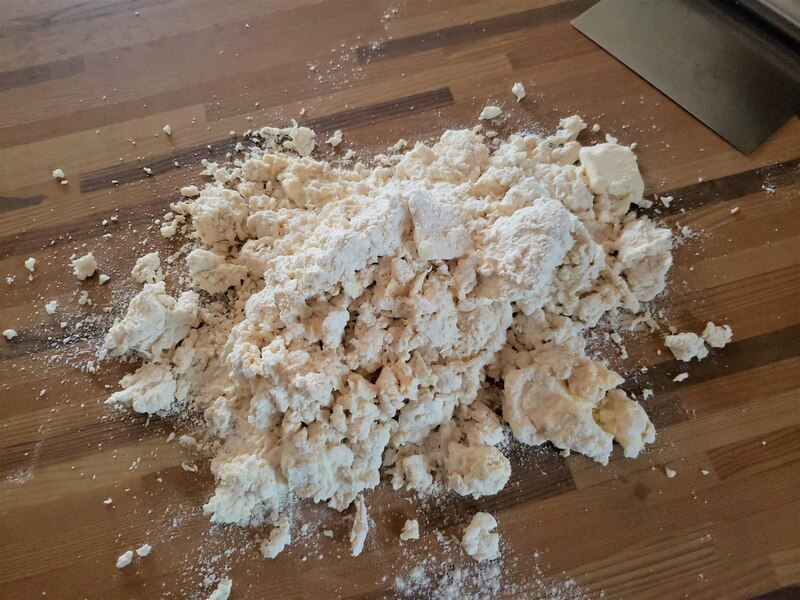 Use small increments of the extra 20 grams of flour…and the help of your bench scraper…to keep the dough from sticking. It is unlikely that you will need all of the reserved flour. cover with plastic wrap and place in the refrigerator overnight (and up to three or four days). It may or may not look risen when you pull it out to use it. That's OK. When you are ready to bake, make the filling: Beat together the cream cheese, sugar, zest (if using), extract and egg yolk. Set aside. If the fruit filling is very stiff, give it a stir to smooth it out..
Divide the chilled dough into two pieces. Working with one piece at a time (and keeping the other chilled), flatten/pat/roll it into a 10" x 15" rectangle. 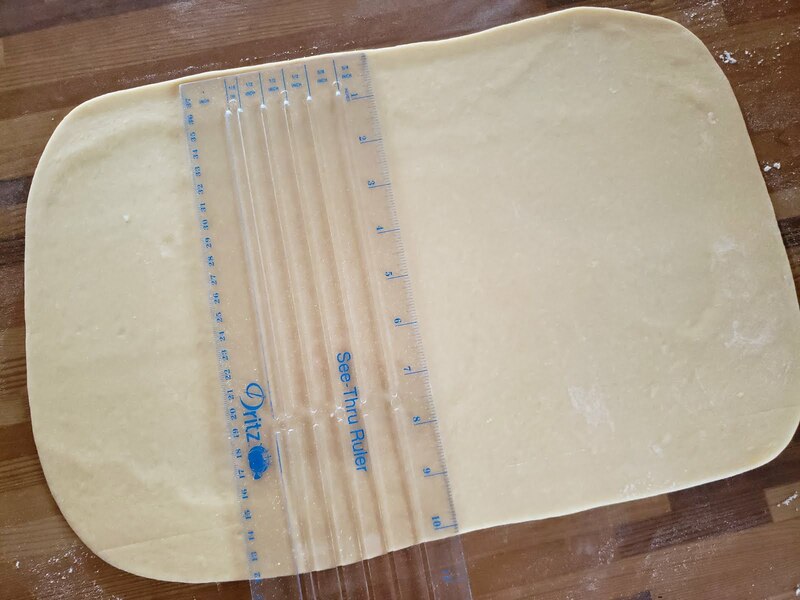 Transfer the rectangle to a piece of parchment paper. Spread half of the sweetened cream cheese down the center third of the rectangle. 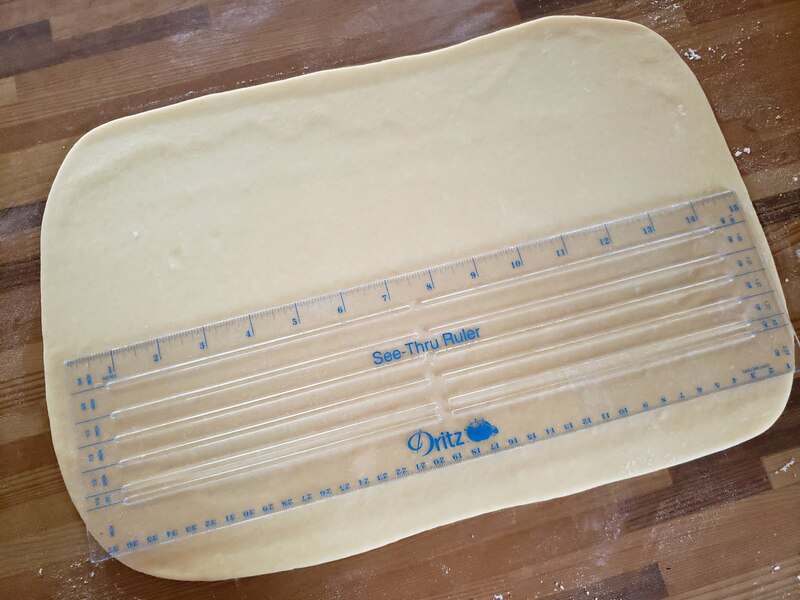 Leave 1/4- to 1/2-inch of dough bare at each end. Spread a thin film of the fruit filling over the cream cheese…being careful to not let it drip over the edge of the cream cheese. 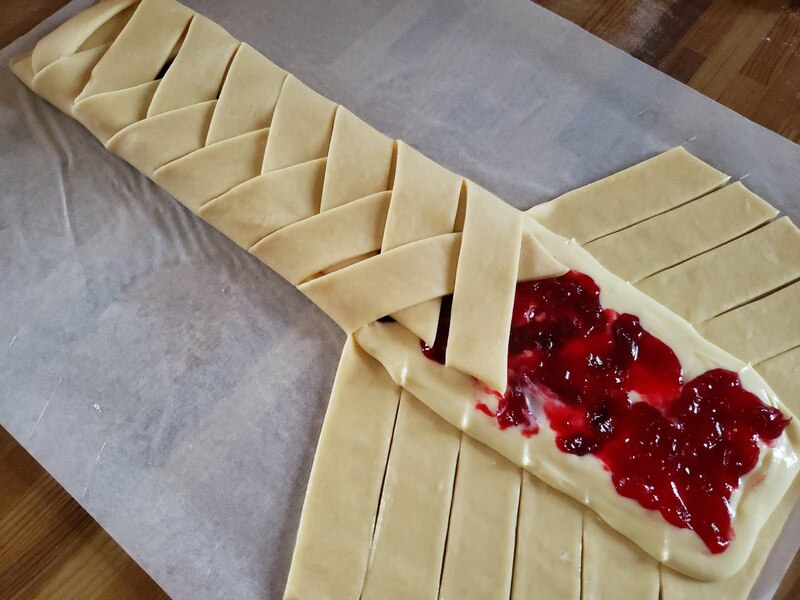 You will be tempted to add more fruit filling…but don’t. A third of a cup is plenty. Using a pizza cutter (or a sharp knife), cut 12 to 13 slightly slanting lines down each side—angling the cuts from the edge of the filling to the outside edge of the dough. 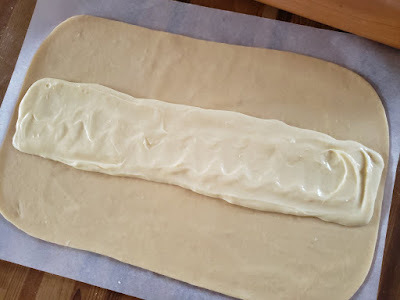 The cuts should be a generous one inch apart and should start about 1/4- to 1/2-inch away from the edge of the cream cheese. 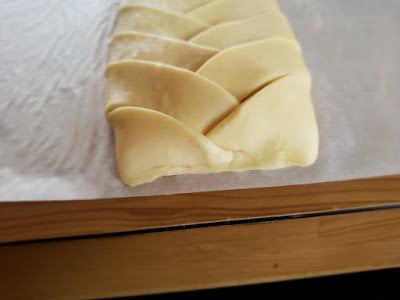 Fold the strips of dough over the filling, criss-crossing the strips by alternating a strip from the left with a strip from the right. Lightly press/pinch at the two ends to seal. 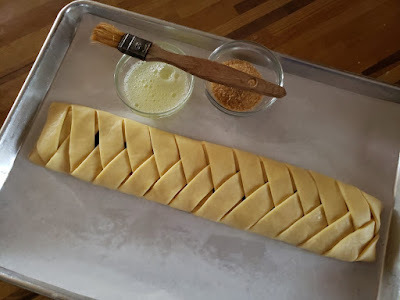 Transfer the braid to a sheet pan and cover loosely with greased/sprayed plastic wrap. 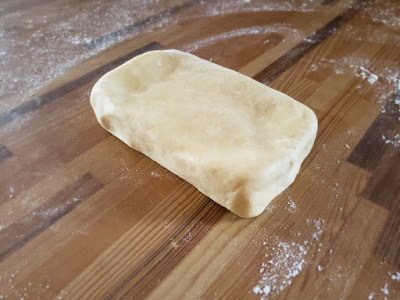 Repeat the process with the remaining piece of dough. Transfer the braids to the refrigerator for 8 hours or overnight. Pull the braids out of the fridge and let them warm up a bit (20 minutes or so) while the oven preheats. Or, let the braids rise at room temperature for 60 minutes (if you want to bake them the same day you form them). Whether you choose a traditional rise at room temperature or an overnight cold rise, the loaves will not “double in bulk.” They might look a bit puffy, but that is all. This is how it should be. 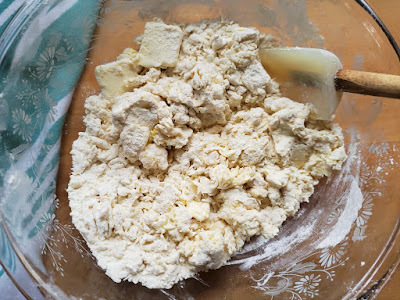 To finish and bake: Brush the egg white/water mixture over the loaves. Sprinkle generously with the coarse sugar. Bake the coffeecakes in a preheated 375°F oven for 20 to 25 minutes, until they're puffed and golden brown. The fruit filling and/or cheese might be bubbling or oozing a bit. This is fine. Remove the loaves from the oven, and place them on a rack to cool slightly. Serve warm. Store any leftovers, well-wrapped, in the freezer. To serve, thaw, and then reheat in a 350°F oven, tented with foil, for about 10 minutes. Although you can put both of the loaves on one sheet pan, I find that they bake best on two sheets. When one is done, just slide the second one into the oven…or bake on separate racks, rotating half way through the baking time. 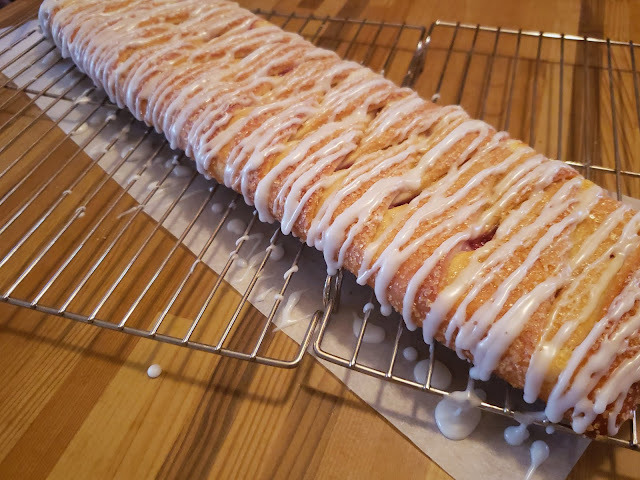 If you like, drizzle the finished braids with a thick glaze made from 1 c. powdered sugar mixed with 1 1/2 T. (or so) of milk. When drizzled with icing, the loaves also look pretty with a few sliced, toasted almonds sprinkled over (especially if you have used almond extract in the cheese filling). Cranberry-orange (my favorite for the holidays): Place 12 oz. of cranberries in a saucepan with 1 c. sugar and the juice of one orange (about 1/3 c. juice). Bring to a boil. Simmer briskly until most of the cranberries have popped and the mixture is thickened—about 6 minutes. Makes a scant 2 cups thick compote. Chill before using. Dried Apricot: Place 1 cup of dried apricots in a saucepan with 3/4 cup of water and 1/2 cup of sugar. Bring to a simmer and cook until the fruit is puffy and any remaining liquid is syrupy (about 15 minutes). 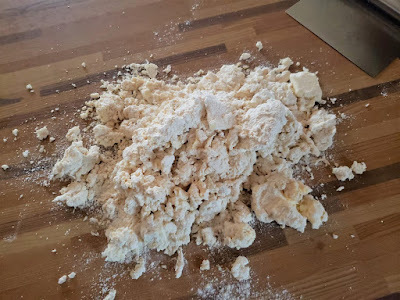 Transfer to the food processor and process to form a coarse purée. Taste and add more sugar or lemon juice to obtain the desired sweetness. Add 1/4 t. almond or vanilla extract, if desired. Chill before using. Makes about 1 cup fruit purée. Quick Berry Jam: Place 3 cups of berries (fresh or frozen) in a saucepan with 1 c. sugar and 1 T. lemon juice. Crush the berries if desired. Bring to a boil. Skim off and discard any foam that comes to the surface. 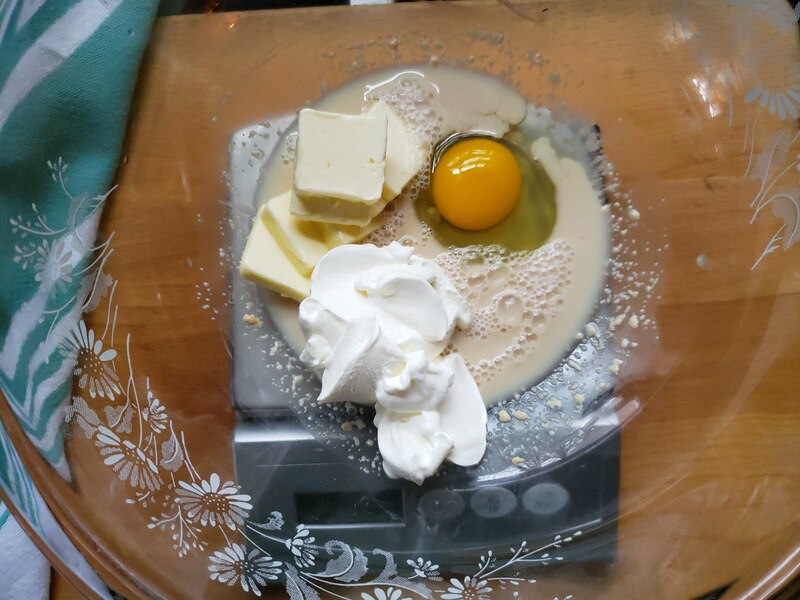 Simmer briskly until thickened—about 8 to 10 minutes (a candy thermometer will read 218° to 220°). Makes about 1 1/3 cups jam. Chill before using. You may also use commercial jam. 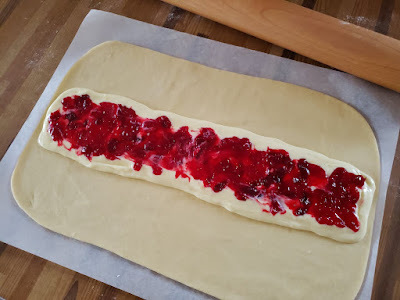 If the jam seems drippy or thin, dissolve 3/4 t. cornstarch in a small amount (1 t. or less) of water and stir it into 2/3 cup of the jam before spreading over the cheese.